Bells are the largest and loudest instrument in the world and church bell ringing is a quintessentially English pastime. The sound of bells ringing is deeply rooted in British culture and almost everyone in Britain lives within hearing range of bells. Whether the bitter-sweet sound of just one bell tolling or the majesty of a whole peal, it has become part of our English heritage and much of the country’s history can be traced through the history of its bells. They have called us to wake, to pray, to work, to arms, to feast and, in times of crisis, to come together. A village team ringing in the start of the 2012 London Olympic Games. Despite coming in many shapes, sizes and materials, most bell towers have a familiar layout. At the top are the bells, spreading the sound out to the community by means of louvres in the walls. The bell ringers themselves usually stand on the ground floor. At the top of the tower, the bells are hung in a wooden or metal frame with each bell fixed to the axle of a large wooden wheel that pivots in ball bearings on the frame. A rope is tied to the wheel spokes, runs partly round the rim and falls through holes and pulleys to the ringing chamber below. From here the bell ringers use the ropes to control the bells. The ropes come down from the ceiling in a circle by the pitch of the bell – usually so the strikes go clockwise around the room in descending pitch. Bell ringers stand in an inward-facing circle behind the ropes. Treble, cast by John Taylor & Co. of Loughborough in 1848. 25 5/8” (65cm) diameter, 326 lbs (148kg). 2nd, recast by Alfred Bowell in 1923. Originally cast by Henry Bagley in 1670. 27” (68cm) diameter, 444lbs (202kg). 3rd, cast by John Ruffard in around 1365. 28 3/4” (73cm) diameter, 433lbs (197kg). 4th, cast by John Taylor & Co. of Loughborough in 1848. 30 3/4” (78cm) diameter, 458lbs (208kg). Tenor, cast by Henry Bagley in 1670. 36½” (93cm) diameter, 863lbs (393kg). Change ringing is the art of ringing a set of tuned bells in a controlled manner to produce variations in their striking sequences. This may be by method ringing in which the ringers commit to memory the rules for generating each change, or by call changes where the ringers are instructed how to generate each new change by calls from a conductor. This creates a form of bell music which is continually changing, but which cannot be discerned as a conventional melody. Change ringing originated following the invention of English full-circle tower bell ringing in the early 17th century, when bell ringers found that swinging a bell through a large arc gave more control over the time between successive strikes of the clapper. This culminated in the custom of ringing bells through a full circle, which enabled ringers to accurately ring continually-changing sequences, known as “changes”. Change ringing is practised worldwide, but it is by far most common on church bells in English churches, where it first developed. There are over 5,000 bell towers for change ringing in England, with less than 300 in the rest of the world. The way the bells are hung is what makes English change ringing unique and so different to anywhere else in the world. Bells are made from an alloy of copper and tin and are arranged in the tower down the musical scale from the smallest (called the ‘treble’) to the biggest (‘tenor’) which is the lowest note. 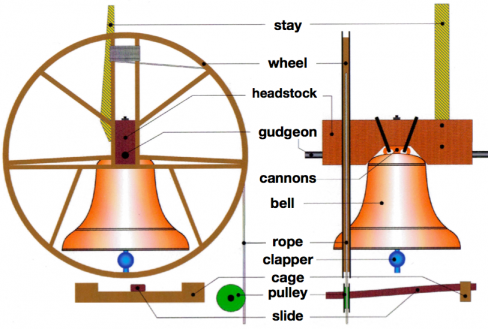 Bells are hung within a wooden or steel frame and attached to a wheel. They rotate around the centre of the wheel, with the ‘clapper’ in the centre striking the inside of the bell to sound. The special feature of English bells is that they have a ‘stay’ which allows them to pause in an up-right position. This means the ringer can control when they strike by pulling them from this ‘set’ position to swing at the correct time. Change ringing is a social team sport, a highly co-ordinated musical performance, an antique art, and a demanding exercise that is conducive to well-being. The Grand Union Benefice has a team of bell ringers, based at Blisworth. 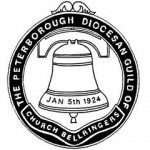 They are members of the Towcester Branch of the Peterborough Diocese Guild of Church Bellringers. For more information about the guild, please click here. 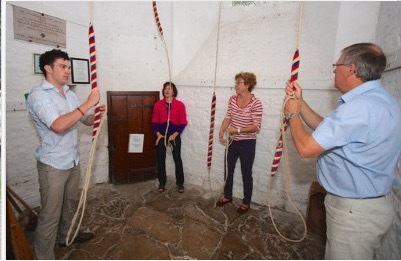 The Blisworth Bell Ringers try to ring at all five churches in the Benefice, which have bells, on Sunday mornings prior to services, so that each tower is usually rung at least once a month. In addition to this, they organise days out to visit and ring at other towers around the region and take part in special events. The Band has approximately seven trained ringers and three learners. Most are from Blisworth, with others from Hunsbury, Roade and very occasionally one from Alderton. They range in age from teenagers to senior citizens. Anyone is welcome to come along and have a go, from complete beginners to returners. No particular level of fitness is required. Indeed to ensure the continuation of this essentially English art it is vital that more learners join. Practice is at St. John’s Church, Blisworth each Monday from 7.30 till approximately 9.00pm. If you are interested in joining or even just having a go, please come along to one of our practice sessions or contact our tower captain, Mason Masterman, on 01604 858985. Everyone is welcome!